Author: Debie LeBeau. Series edited by: Wilfrid H.G. Haacke. 18 pp. Roman, 301 pp. The present study points out the traditional and western Public Health in the Namibian township Katutura near Windhoek. Because of its multiculturality and the disposability of both western and of diverse traditional methods of treatment, the author has the possibility to carry out comparative investigations. Based on her dissertation (2000, PhD thesis, Rhodes University, Grahamstown / Republic of South Africa) and the corresponding field studies, Debie LeBeau works out qualitative and quantitative sources in her work. Apart from western medical scientists and traditional healers also several patients acted as her informants which reported their experiences with both health systems. The book contains a detailed description of the socio-cultural background of Katutura and Namibia and examines thoroughly both the behaviour of the patient against the two possible health systems and the social and spiritual background of the deseases. In the extensive appendices the methods of research are described, seven traditional healers are introduced, an interview with inhabitants of Katutura is documented and case studies about the application of traditional medicine are presented. Der Autorin gelingt es, in mehrperspektivischer Weise (Funktions-) Störungen (disorders) in den Blickpunkt zu rücken, ohne gleichzeitig eine bewertende Unterteilung in krank versus gesund zu machen. Darin liegt die Stärke des Buches. The book presents a very useful overview of the wide range of treatments available across diverse cultural settings. It pays particular attention to the intricacies involved in how people negotiate the different health care sections as they seek and make decisions concerning health and illness in a post-colonial and multi-ethnic location of Katutura. [...] “Dealing with Disorder” is [...] the first of its kind in Namibia and presents original anthropological knowledge for those interested issues concerning the interplay between a variety of health care modalities in a township in Namibia. 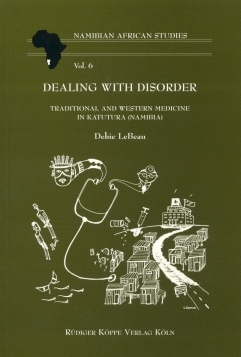 The book provides an excellent overview of issues surrounding traditional and Western health care in postcolonial Namibia and presents LeBeau’s own research, which [...] reflects the complexities inherent in the topic. [...] The analysis of survey data may be cumbersome, but other raw data–specifically, the case studies used as examples in the text and the more detailed accounts in the appendixes–provide a rich layer of complex information and allow the informants’ stories to be heard in their own words. In these ways, Dealing with Disorder offers both an interesting account of health-seeking behaviors in a modern pluralistic context and a valuable transparency regarding the creation of anthropological knowledge through fieldwork.